Anyone who has enjoyed Peter Brett’s Demon Cycle series has, undoubtably, longed for more tales of Arlen’s days as a messenger. And now the wait is over, because The Great Bazaar and Brayan’s Gold chronicles a few of Messenger Arlen’s most exciting adventures as well as adding a few other extras for fans of the series. The fun begins in Brayan’s Gold, where Brett allows a reader to tag along behind Arlen on one of his first messenger trips. While this is a rather short journey (geographically and novella length wise), there is still more than enough suspense, demon fighting, and character development packed into the tale to make it a must read for fans – if, for no other reason, than Arlen’s personality and deeply held beliefs shine through. The Great Bazaar catches up to our young messenger years later. Now, Arlen has been seasoned by years on the road, has earned a reputation as a fearless adventurer, and has attracted friends who are willing to aid in his obsession for ancient wards – in return for help in other areas. And so this novella finds Arlen traveling the desert near Fort Krasian on an errand to uncover priceless pottery for his merchant friend Abban. Once Arlen gets to the abandoned town, however, he finds that it is thoroughly demon infested (Where isn’t in this world?) by a variety he has not encountered before. Excitement ensues immediately thereafter and continues when Arlen later confronts Abban about not warning him of these unique demons. The next two stories in this collection are actually deleted scenes from The Warded Man. The first is the proposed prologue to the book, which focuses on Arlen as a child. The second story is about Leesha and an encounter she has with a former friend. Both are relatively short, but each adds another layer to each character that all fans of the series will definitely enjoy. The book finishes up with a Krasian Dictionary and a ward grimoire. Neither of these add much to the overall story but are great reference materials for the series itself. As I reflect on this story collection, the most enjoyable element for me was how Brett presents Arlen as a regular person. He is driven. He is talented. He might even be special, but . . . he makes mistakes. Mistakes that cause him harm: Physical, emotional, and spiritual. Nor is Arlen’s judgment with people supernatural. He does trust the wrong people. He gets tricked by them. And when he should admit their duplicity, he tends to ignore it, because of his very human fondness for them. All of which made Arlen much more relatable and easy to empathize with than the superhuman, infallible “Chosen Ones” who litter fantasy literature these days. 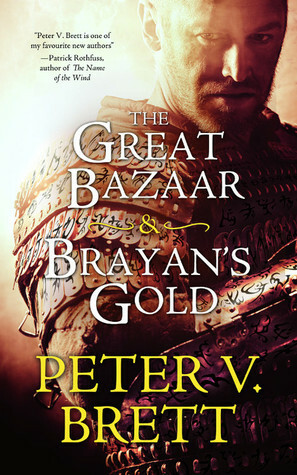 Now, The Great Bazaar and Brayan’s Gold isn’t a story collection that will astound you or turn the Demon Cycle on its head, but it is a very entertaining companion piece to The Warded Man, which every fan of the series will definitely want to read. I’d also encourage fantasy fans in general to check it out, because reading about a demon infested world is always a blast. 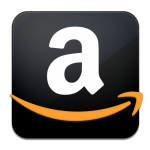 I received this book from Tachyon Publishers and Netgalley in exchange for a fair and honest review. I’d like to thank both of them for allowing me to receive this review copy and inform everyone that the review you have read is my opinion alone. Purchase this Demon Cycle story collection at Amazon. This entry was posted in 3 Stars, Epic, Fantasy, Short Stories and tagged Arlen, Brayan's Gold, Demon Cycle, Demon cycle novellas, Demon Cycle short stories, epic fantasy series, Leesha, Messengers, Peter V. Brett, The Desert Spear, The Great Bazaar, THE WARDED MAN. Bookmark the permalink. Interesting. I had given up on the series when Arlen became such an extreme Mary Stu by the end of Warded Man, but really loved the world-building. Sounds like I might actually enjoy these shorts. Brett portrays Arlen as just a young, naïve (though gifted) messenger in these shorts, so it might be more to your liking. It was entertaining enough that I picked up book two of the series. Unfortunately, The Desert Spear has not been that great so far, but I’m hoping it will improve in the second half of the book.